The Greater Boston Bigfoot Research Institute (GBBRI) lies between a gas station and a laundromat in Roxbury, a neighborhood of Boston. 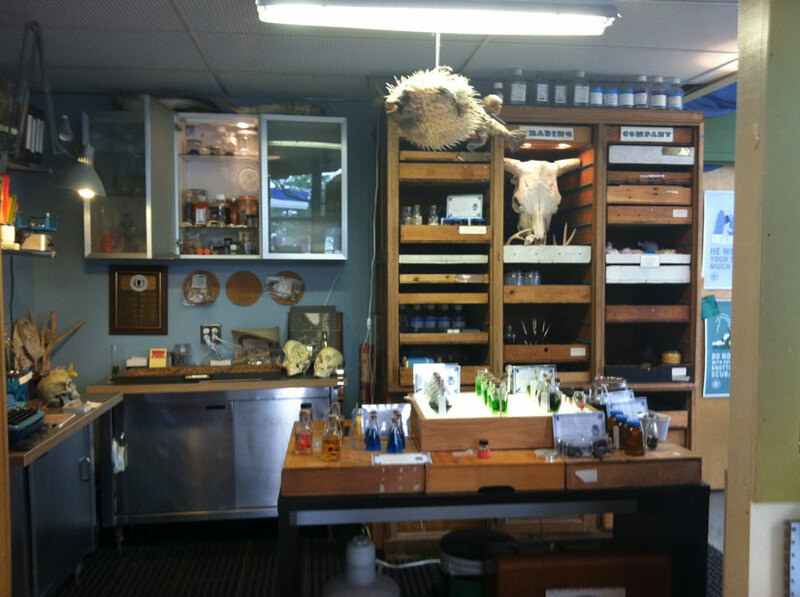 Since 1963, GBBRI has convened researchers focused on cryptozoology, or the study of “hidden” animals. GBBRI became a hotbed of activity in the 1970s following the emergence of the now-iconic Patterson-Gilmin Super 8 film, which depicted an adult male bigfoot moving across a meadow. Loss of funding in the mid-1980s led to a near-disappearance of the institute; in 2009, I joined a star team of researchers to bring this research center back from extinction. If it was difficult for you to tell fact from fiction in the paragraph above, then you have an inkling of what it is like to visit GBBRI. The GBBRI and associated retail store is, in fact, an elaborate front for 826 Boston, the innovative writing lab that offers free or low-cost creative writing experiences to kids ages 6 – 18. When you walk into GBBRI, you might hear a low din of children’s voices. 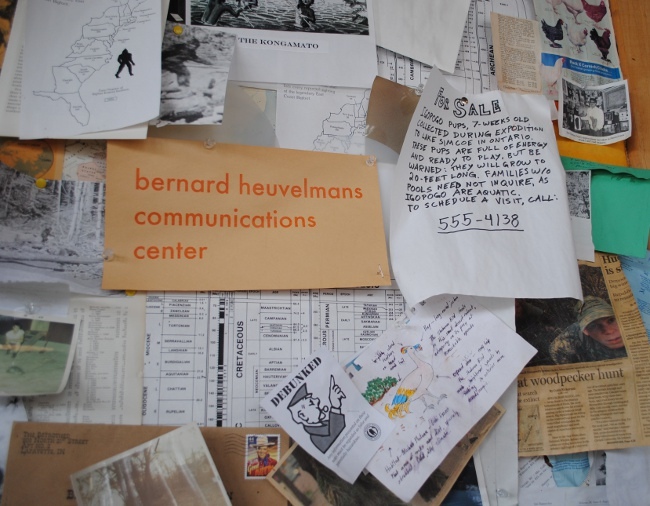 Look a little harder, perhaps past the Bernard Heuvelmans Communication Center/secret door, and you will find at least a dozen kids and volunteer mentors, doing homework, writing manifestos, singing newly minted rap songs, and more. 826 Boston is one of a national network of 826 workshops, started by Nínive Calegari and Dave Eggers in 2002; the first workshop was at 826 Valencia St, hence the 826 name, and San Francisco zoning laws required a retail operation at address. Thus, the pirate supply store was born. Each subsequent 826 workshop has been anchored by a similarly creative retail store, offering both a revenue stream and inspiration space for young writers and the adult volunteers who make the place work. I did, in fact more than fiction, work with a star team on the project to develop the storefront for the newly initiated 826 Boston workshop. Under the leadership of 826 Boston Executive Director Daniel Johnson, I acted as exhibit developer in very close collaboration with graphic designer Amanda McCorkle, writers Max Greenberg and Peter Sherer, researcher and expert circus gaff maker Dave Bickham, mad scientist Brad Simpson, the brilliant scatologist Ali Reid and many other volunteers to create a space that would pair serious retail objectives with a need for a playful laboratory for young writers and scientists. 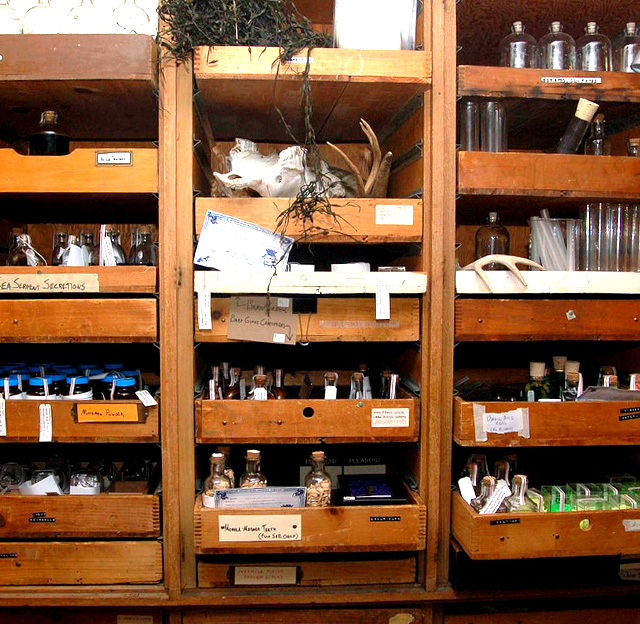 We wanted to emphasize that much of science– of experimentation and discovery– has its roots in play and inquiry. What better way to get kids asking good questions than to create a space about cryptids, creatures that may or may not exist? To emphasize our creative mythology about the roots of GBBRI as a struggling research center and create a stage for play and inquiry, we set a few rules. 1. SOCIETY FOR CREATIVE ANACHRONISM: First, nothing in the shop could have been invented after 1978. After all, we had just rescued all this equipment from a basement in Cambridge, where it went after GBBRI’s physical lab shut down in the mid-1980s. Mimeograph machines, slide projectors, tape recorders, Super 8 cameras, light boxes, scavenged binoculars: this is what constitutes high-tech at GBBRI. The nostalgia factor grooms adults into thinking about stuff they saw/used/recognized when they were younger, and subconsciously brings them back to a time when they were about the size of the kids behind that hidden sliding door. 2. QUESTIONS COUNT: We set up a number of subtle interactives that would allow kids the opportunity to question and grown-ups the opportunity to be playful. 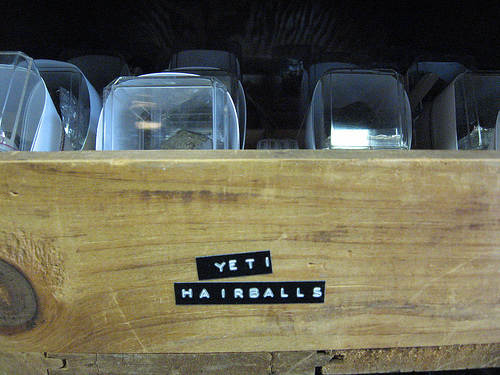 An owl pellet– purchased from a science supply store– became a “yeti hairball.” The first question kids ask is “Is that real?”; to which, the “researchers” in the space always respond, “Well, what can you notice about it?” To allow grown-ups to walk the fine line between absurdity and teachable moments, we had to create objects that flipped power dynamics. Sometimes, an adult in the space will know about as much about whether an object is “real” (or, rather, really what it says it is) as the kids do. That allows for a creative moment in which a kid can tell a story about some crazy hybrid animal it once saw in Franklin Park, and the adult is primed to follow that story wherever it goes: and vice versa. 3. SECRET, SECRET: Adults might walk into this space once or twice to check out the wares (yeti hairballs, for instance, are for sale and all proceeds go to the writing workshop), but kids were going to be in the space day after day. We needed to embed some surprises and rewards to keep the store fresh. For example, playing off the idea that kids think their teachers sleep at the classroom and have no life outside school grounds, we created a suspended bunk bed above our back storage closet, complete with a pillow, foam mattress and a sleeping bag. Researchers shift the covers around a bit every day or so, and switch up the book that is propped by the bed. Elsewhere, we transformed a big art transport crate into the “Pre-Expedition Literacy and Research Pod” by upholstering the interior in tan nagahyde (in keeping with our 1970s aesthetic), installing small reading lights, and hinging the door. Kids who finish their homework early get to tuck into the crate and read, hidden in plain sight. Most people walking through the big wooden box have little idea that there’s often a kid reading away inside. For information on 826 National and a look at the creative products sold at 826 stores nationwide, visit here.